When ‘cure-all’ bone broth first exploded onto the scene, it joined the venerated throng of superfoods that came before it, from coconut water to kimchi, and of course, wheatgrass juice. It quickly became the reserve of Paleo blogs and the likes of Gwyneth Paltrow’s GOOP, who all extolled chugging the collagen-rich liquid daily. The ‘bone broth diet’ followed and the Instagram posts of simmering pots and takeaway cups from so-called ‘broth bars’ crescendo-d to a…boil. I won’t lie, I was irked by it. Right down to its name—bone broth—which seemed a fashionable alias for what was really being sold: The same old soup base we’ve been making the world-over for hundreds of years: homemade stock. Just think of the things we’ve historically eaten to restore: chicken rice porridge, long-simmered pho, ramen, tortellini in brodo, matzo soup or consommé. So what made bone broth such a novel elixir? I could count on one hand the number of newly discovered superfoods that have enjoyed long lives elsewhere—take the fermentation hype and the rise of kimchi, sauerkraut, or kombucha. Don’t get me wrong, these are things that I love, but let’s pay credit where credit’s due, namely to the wisdom of culinary traditions. If we looked less for cure-alls and learned to cook a variety of foods rather than hopping from one trend to the next, we’d be pretty well taken care of. We might be less a little less crestfallen, too, when the media tears down the latest fad—just think of coconut oil’s rollercoaster of love-hate public attention. But semantics and culinary history aside, having done my research and tried my hand at bone broth, there are a couple of things I can in fact get on board with. Bone broth itself is beautifully savory and rich in flavor, making a great base for a range of soups (I doctored mine into a kind-of pho) and stews. As for the nutrition, yes it’s nourishing—but perhaps don’t chug it in volumes that are recommended to you via the bone broth diet. It always pays to remember that a healthy diet is a varied one. Oh and it turns out it is different to traditional stocks, too. Bone broth is a slow-cooked stock made of meat bones. 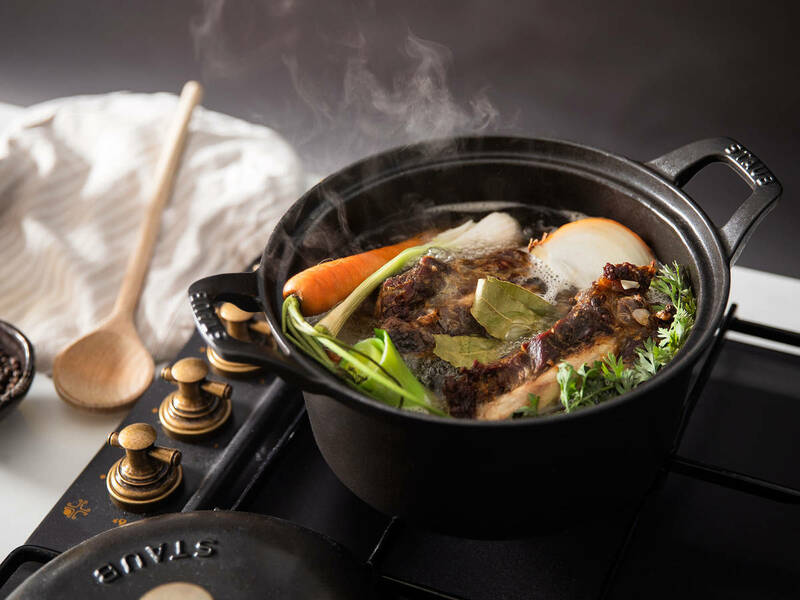 It differs to traditional stock in terms of cooking time, as it’s cooked from anywhere from 6 to 24 hours to allow the bones, tendons, and cartilage to break down and the marrow to be released, providing a rich source of collagen and amino acids. Unlike stock, which is often used as the base of soups or stews, bone broth is drunk as is, out of a cup—sometimes even on-the-go, should you live in a city with a string of bone broth bars. Here’s a closer look at the good bits in bone broth. Collagen is present in the skin, tissue, and bone marrow and strengthens the bones. It can’t be consumed whole and must be broken down to digestible gelatin, which gives bone broth its characteristic quasi-jelly-like texture, and amino acids. Collagen has many benefits for the body such as strengthening bones, lubricating joints, and promoting healthy hair and nails. Amino acids aid the digestive system by reducing inflammation, boosting the immune system, and supporting the growth of healthy probiotics in the gut. But, as always, there’s no one cure-all. Although it is a great source of collagen and amino acids, which are already present in our bodies, many health professionals purport that it is indeed the high volume of collagen may not be in fact be effectively absorbed by your body. Many recommend focusing on maintaining a healthy diet high in foods rich in vitamin C and lysine like leafy greens, nuts, and oily fish to support your body’s natural production of collagen. Additionally, the long heat treatment to actually extract the beneficial collagen means that some of the vitamins and minerals will naturally be destroyed during the cooking process. As Jennifer McGruther, author of Nourished Kitchen told NPR’s 'The Salt', "I think the real benefit of bone broth is that people are returning to the kitchen to prepare homemade, whole foods from scratch. There's always benefits to cooking foods from home, and that's exactly what we're seeing with bone broth." This, I think, we can all agree on. Despite the cost of a commercial cup, bone broth is a cheap dish to make at home. Since the broth uses up oft-discarded bones, it’s a great way to minimize food waste and make the most of the animals we rear for consumption. You can even repurpose a roast chicken carcass or, say, beef ribs by putting them into homemade bone broth, or you can start from scratch and ask your local butcher for economical soup bones. As always, it’s important to use the highest quality you can find, from an animal that was raised in a healthy environment. After all, we are what we eat. Vary the recipe with any of the above, and experiment with different herbs and spices inspired by your own palate or classic soup recipes—add cinnamon, star anise, and coriander seeds to give your beefy stock a pho slant, parsley and black peppercorns for a chicken noodle soup feel, or fennel seeds to lean towards an Italian wedding soup. Just make sure the seasonings match the meat. 1. To accelerate the breaking down of the bones and intensify the flavor, spread your bones out on a baking tray and bake at 220°C (420°F) for approx. 20 min. until the bones are dark and fragrant. You can also add your aromatics and vegetables (roughly chopped or whole) in the final 10 min. of cooking time. 2. For every 1 kg (approx. 2 lbs) of bones, use approx. 1.5 L (approx. 6 cups) of water. Place all your ingredients in a heavy-bottomed pot, salt well, and bring to boil. 3. Reduce heat to low and leave on the stove to simmer with the lid slightly ajar for up to 24 hours. Skim any fat or impurities off the top periodically and add more liquid as needed to keep the bones covered. For this reason, it’s not ideal to leave the pot on the stove overnight, unattended. Simply cook it for as long as you can, let it cool, place in the fridge and put it back on the stove the next day. 4. Once cooked, the bones should be brittle and you should be left with deeply colored, hearty liquid. Let the liquid cool a little, then strain into jars or containers and reserve in the fridge or freezer. Remove any fat that settles on top during the cooling process as desired. Warm up the broth and drink it alone, or use it as a rich base for soups or stews. What do you think of bone broth? Do you have a preferred recipe or will you be sticking to regular stock? Let us know in the comments.